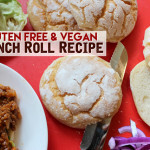 EASY Gluten Free Crunch Roll Recipe - Vegan! In the small town where I grew up, there was a little sandwich shop that served everything on homemade Dutch Crunch Rolls (aka Tiger Bread) and it was my favorite! I used to peel off the top of the bread and save it for last. 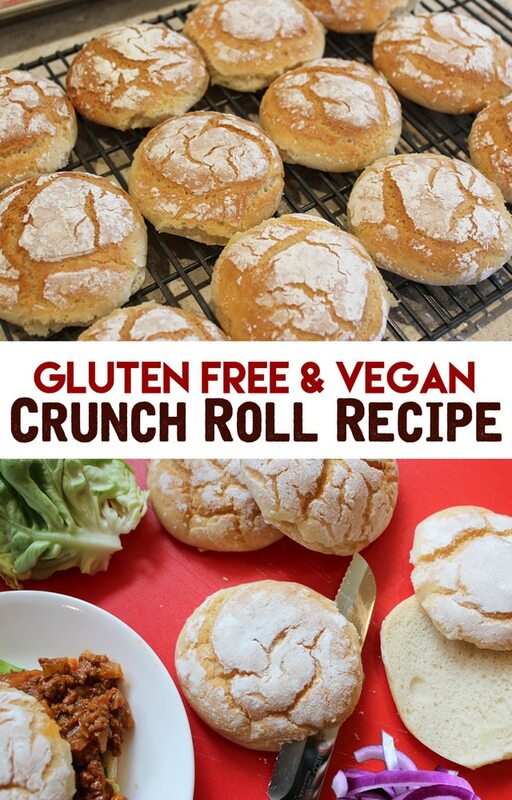 This Gluten Free Crunch Roll Recipe reminds me of those rolls… Soft on the inside, but Crunchy on the top… Perfect for Sandwiches, Burgers, Sloppy Joes, Melts & Gravies. 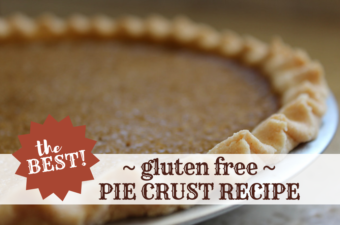 Plus, it’s Vegan & so easy to make! 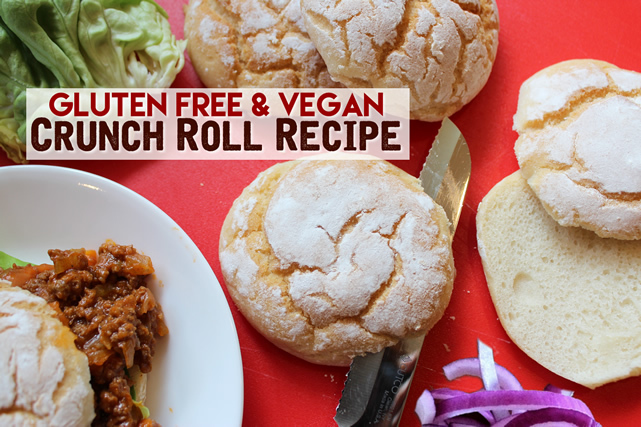 This EASY Gluten Free Crunch Roll Recipe is also Vegan! Perfect for Sandwiches, Hamburgers, Melts, Sloppy Joes & Gravies. Soft on the Inside, but Crunchy on Top! 1 3/4 Cups Milk Alternative – Warm, but not hot. 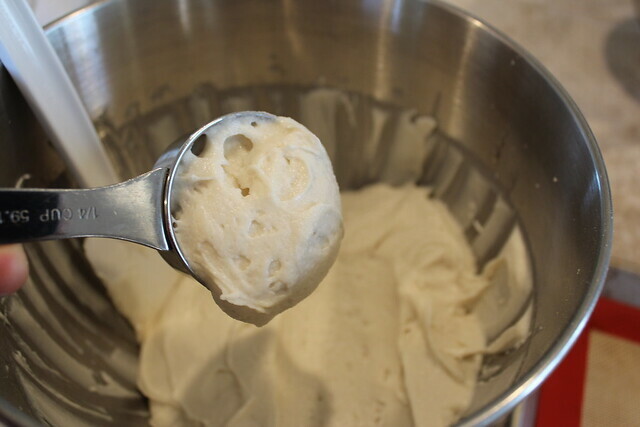 While Yeast Mix is Proofing, Whisk together your Dry Ingredients & measure out your Add Last Ingredients. Line a Baking Sheet with Parchment or Silpat Mat. Add Dry Ingredients to Proofed Yeast. Using the Paddle Attachment, mix on Low speed while adding the Oil & Apple Cider Vinegar. Continue mixing on Medium/High for approx. 2-3 minutes. 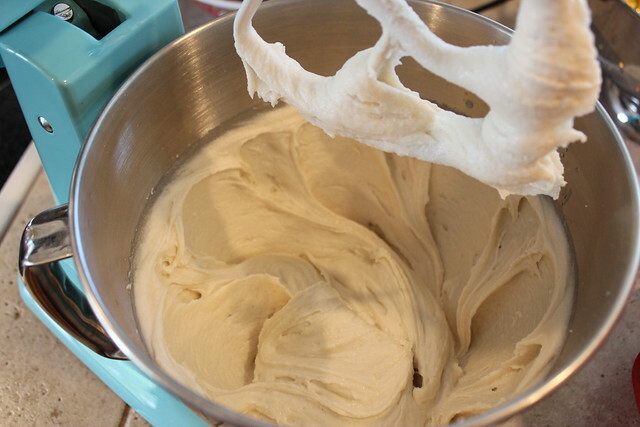 The mixture will be thick & sticky (nothing like regular dough). Scoop approx. 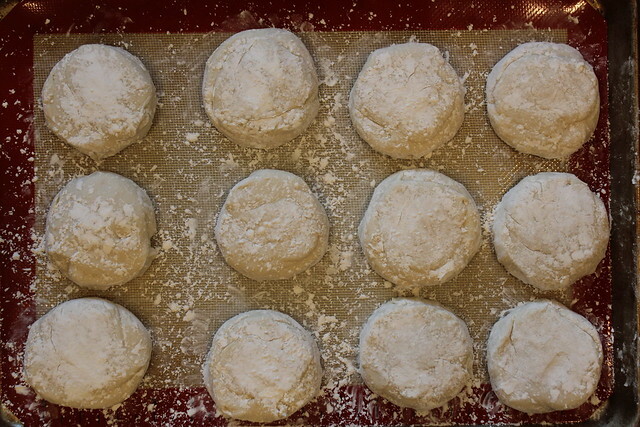 1/4 cup dough onto the prepared baking sheet. I use a 1/4 cup measuring cup & spatula for this. 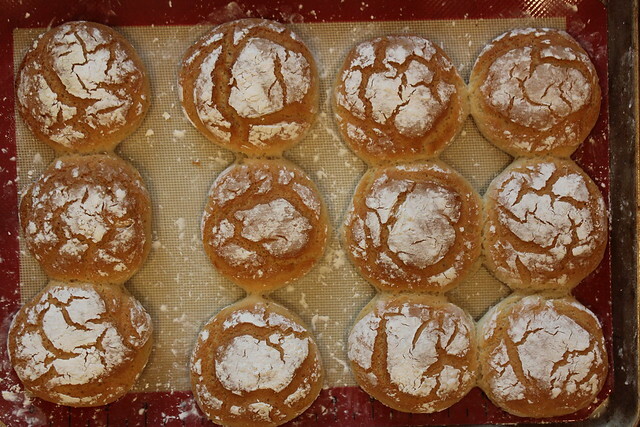 Repeat until you have 12 dough rounds spaced about 1″ apart. Using well starched hands, generously dust the tops of the dough and hand shape into rounds – I think the shape resembles a hockey puck. 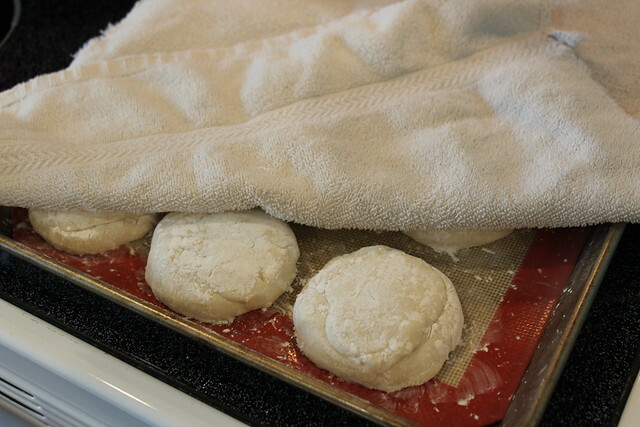 Cover the rounds with a dish towel and set-aside in a warm spot to proof for approx. 20-30 minutes while oven is preheating. Don’t overproof these. 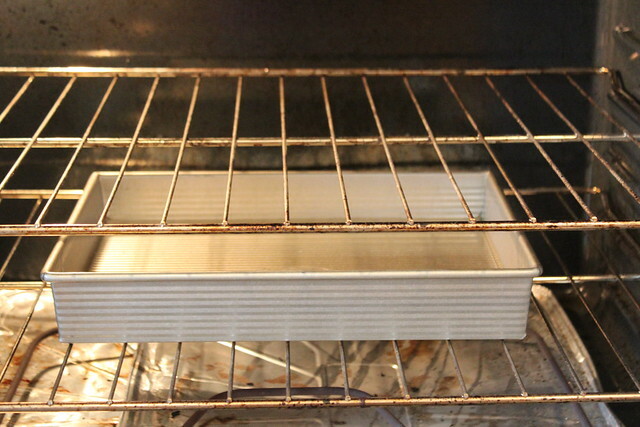 Prepare a water bath by filling a baking dish approximately 1/3 – 1/2 full of water & place on the 2nd lowest rack in the oven. 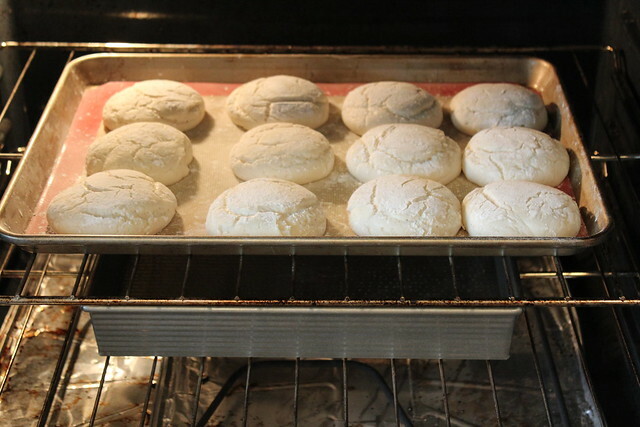 Once Rolls are done proofing, remove the towel and place in the oven on the upper rack. 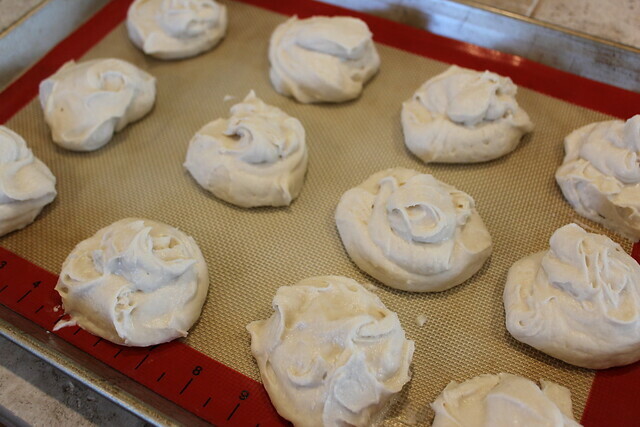 Bake until the rolls are done & browned – approximately 25-30 minutes. 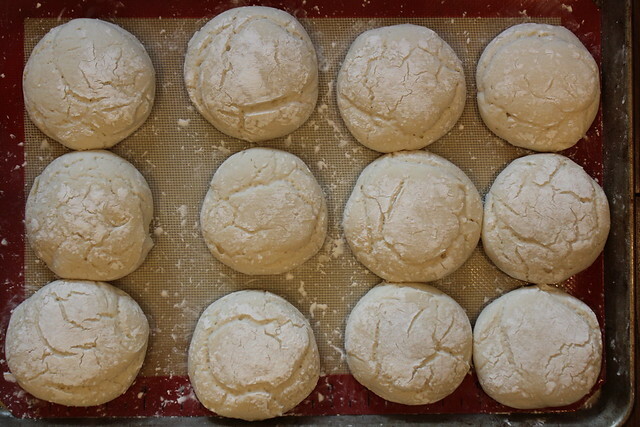 Remove from oven and place rolls on cooling rack. You MUST cool these completely before splitting in half. Psyllium Husk Powder gives extra stability to gluten free breads. However, I realize not everyone has this on hand, or you may prefer not to use it… That’s ok, this recipe works with or without it (in fact the photos were taken of a batch I made without it). But, please keep in mind that your rolls may be slightly flatter/thinner than if you used the Psyllium. 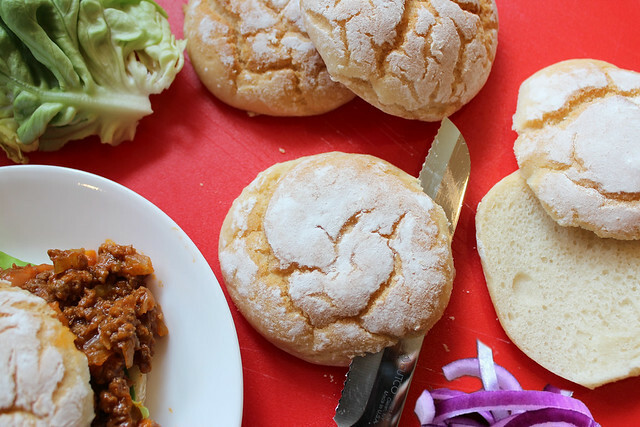 Place leftover rolls in an airtight container & store on the counter or fridge for 2-3 days. To soften rolls from the fridge, wrap in a paper towel & microwave for 15 seconds – Be sure to split/slice them open before re-heating. Hi could you please let me know if I can use regular eggs instead of the Egg Replacer? If so then how many eggs should go in this recipe please? These look bakery-perfect! I am in awe. And healthy too? Yum! I used chia seeds instead of the psyilium husk.You were right eventhough I put the wrong measurement of tapioca flour. I made these and a beautiful chicken pot pie. I replaced the ener-g egg replacer with two eggs–doesn’t look good. Maybe if I’d of been smart and left out the oil and vinegar? Anyone have an answer for using eggs instead of the replacer? I need the gluten free but I’m not vegan. Thanks! I cannot use egg replacer as it has potato starch (husband is allergic), so will use real eggs. 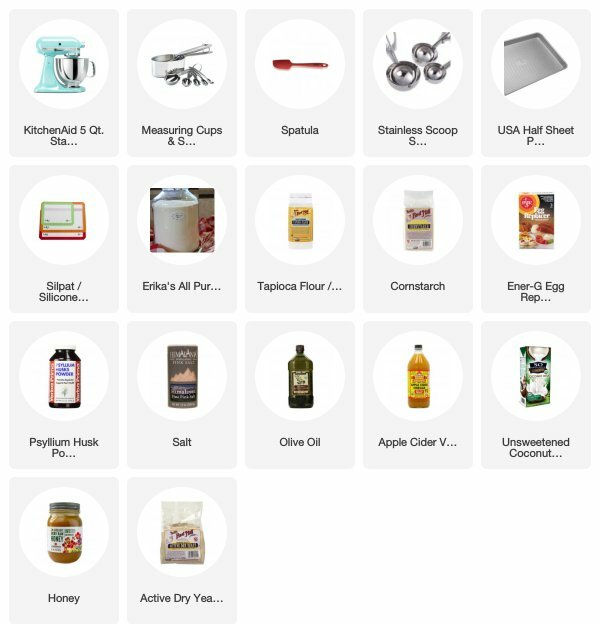 Do I delete the olive oil and cider or just olive oil. 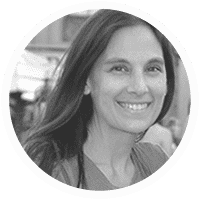 Hi Erika — I see that your flour mix is mainly all rice flour. According to my dr. white and brown rice is 5% gluten — he gets into the dna of food — and I know I react to rice. 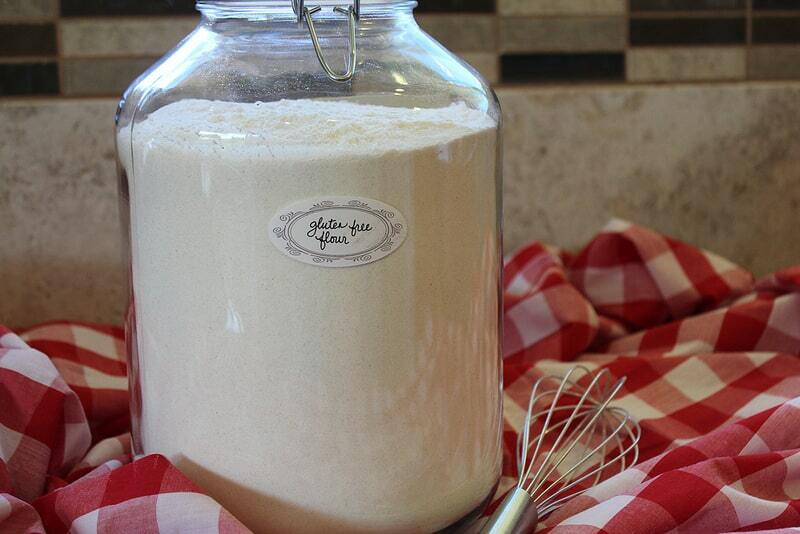 My question is, would your recipe work using Bob’s Red Mill Gluten Free Flour? Also, would guar gum or psyiliam husks work instead of xantham gum? Thanks. My oven is in the wall. so I’m unsure how to proof in a warm location? Can I put them in my oven on the lowest temp? I too would prefer to use eggs – any idea how to make this work for the recipe? What ingredient can be used in place of energy egg replacement?
. Has anyone tried it with success? Wow- thank you so much! 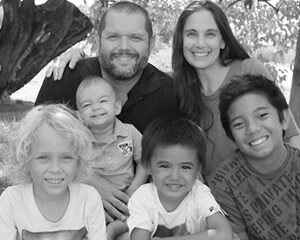 My son has been dairy allergic most of his life, gluten free a few years and just last month we entered egg free territory. I’ve been baking a lot of test ‘bricks’ the past few weeks, trying different recipes, and stumbled upon your site. Tried this recipe tonight with great results – a keeper! Hi can I use water instead of milk replacer …. daughter can’t have milk and I don’t have any milk replacer in the house. Perfect! Made these as written. second time i have made these and they were even better this time as I made them a little too big last time. these are amazing and are great as a bun for hamburger or even sliced meat! thank you so very much for this recipe!!! I would love it if you could come up with a Gluten Free, vegan English Muffin. The one’s I have tried from the store are so dense. 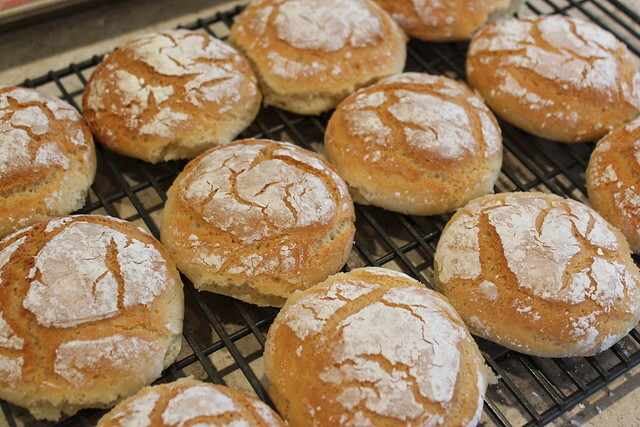 I’ve made these as rolls and last week I tried it as a loaf of bread. It went great! I increased the cooking time to ~40 min. At the 20 min. mark I covered the loaf with aluminum foil as it had already nicely browned and I decreased the temperature to 375*F. I did not use the psyllium husk OR coat the top with tapioca starch. 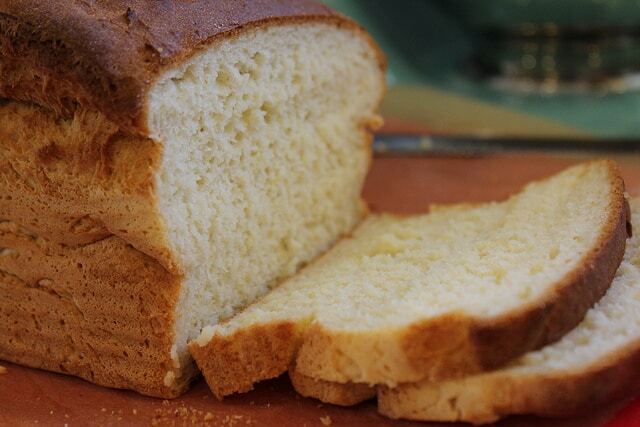 The taste is better as a roll, but the texture in the loaf is incredible! It’s just like eating wheat bread and has thus far been best for grilled cheese sandwiches <3 Makes 12 good sized slices. Flavor as a loaf and stickiness of adding tapioca starch are the only thing keeping this from being 5-star for me. I'd give it a 4.5 if I could. OMG! I just made these & they came out perfect! 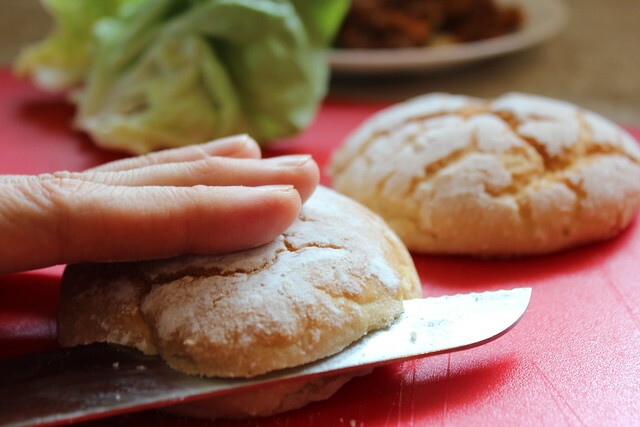 I have been searching for a Gluten Free Hamburger Bun Recipe for a long time & finally found a recipe that works. I wet my hands a little so I could smooth out the tops and then sprinkled sesame seeds on top. Even my husband ate them and said they were delish! Thank you!!! HERE is a good flour blend to use in these rolls.